For the third year running, two staff members from our Group have supported St Kentigern’s Christmas Tree Collection service in exchange for donations pledged to the Hospice. 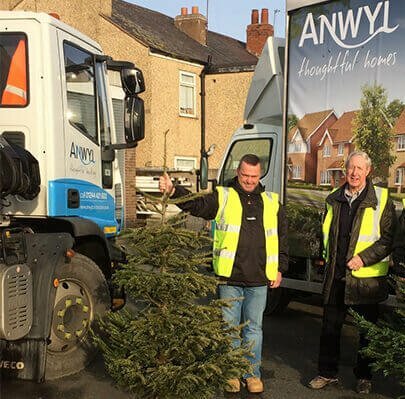 Dave Jones and Wayne Southall joined a team of volunteers to collect used Christmas Trees around Conwy, Denbighshire and Flintshire. This year, 500 trees were collected and the scheme has raised over £4000, nearly doubling the total raised in the previous year. ” We are thrilled to have the continued support of organisations like Anwyl. Without volunteers kindly helping out on the collection we simply would not be able to carry out this great fundraiser and ensures that all donations made in this collection goes to fund the provision of care at St Kentigern Hospice“. Trees collected by the volunteers are all recycled, and this year they will be given new life being put to use aiding Flintshire County Council with coastal defences, creating homes and shelters for the animals at Welsh Mountain Zoo and providing compost and training materials for the students at Llysfasi College in Ruthin. ” We are delighted to have worked with St Kentigern Hospice again on this project, making a difference to both local people using hospice services and the environment. The total raised this year was over £4000 and this wouldn’t have been possible without the many volunteers, so I’d like to thank our employees Dave and Wayne for putting themselves forward“. St. Kentigern Hospice is committed to meeting the needs of local people, with active, progressive or advanced illness. By providing palliative care they strive to promote the highest quality of life with continuing support for families and carers. Located in St Asaph, St Kentigern Hospice is a local charity providing care and support across the Vale of Clwyd and surrounding areas. In 2019 it will cost more than £1.6 million to run the Hospice which equates to more than £4300 per day. Just 18% of this will come from the Local Health Board, it is only enough funding to support the Hospice for 69 days. The Hospice therefore greatly relies upon on the generosity of the communities it serves in North East Wales to raise the additional funding for the remaining 299 days of the year, enabling them to carry out the fantastic work that they do.